How Can DNA Replication Be Modeled? 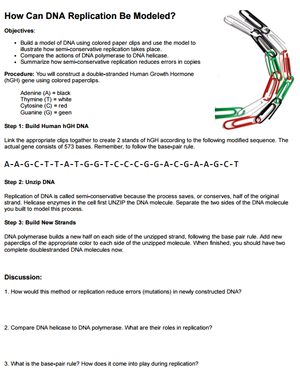 This hands-on activity can be used to show students how semi-conservative DNA replication occurs. Students put a DNA molecule together with colored paperclips following the given key and the base pair rule. Students are then given the steps of replication which involves “unzipping” with helicase and building two new strands using the old strand as a template. Worksheet also includes discussion questions.